I’ve booked in lots of local markets over the next few months – some old favourites and some brand new ones, so I wanted to let you know where you can find me to come and touch and feel things from my collection and stock up for Christmas. 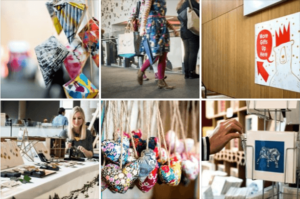 I’m very excited to be taking part in one of the biggest and best Christmas Markets in Bristol held at Colston Hall and organised by the brilliant Bryony of Made In Bristol. I’ll be on the middle level for the first weekend of the fair which is Saturday 24th and Sunday 25th November alongside loads of amazing local makers. You can get all your Christmas shopping done in one place and then relax and enjoy the build up to the festivities! Find out more on the Made in Bristol website.